Fooly Cooly is weird. Fooly Cooly is wild. Fooly Cooly originally aired in 2000 and I saw it in 2003. Fooly Cooly is coming back this Saturday, June 2nd, with brand new episodes over a decade later. 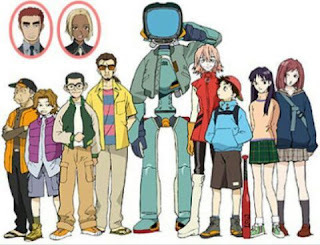 Fooly Cooly, also known as FLCL, is an anime/OVA series about a middle school boy named Naota who lives with his father and grandfather in a small Japanese town. He hangs out with kids his age and his older brother's ex-girlfriend. His brother is in America playing baseball. Naota's life is pretty mundane, a fact that he mentions from the start of the city. This all changes with the arrival of Haruko Haruhara on her yellow Vespa. With a swing of her guitar to his head, Naota's life is turned upside down. Soon, big robots are erupting from his head periodically, including one with what appears to be a TV for his head named Canti. 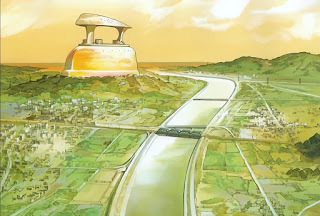 Yeah, this show is weird and I haven't even gotten to the evil corporation named Medical Mechanica, the space pirate king called Atomsk, a secret agent with history with Haruko similar to Naota's using giant fake eyebrows to protect himself and the giant iron sitting menacingly on a hill in Naota's town. All this madness is aided by a soundtrack by the Japanese alt-rock band The Pillows. The familiar guitar strumming of the beginning of the FLCL theme song is a signal that we are or have just witnessed something strange and oddly fun. 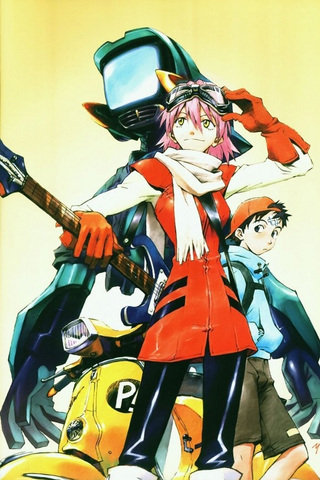 FLCL is a story of a strange space woman looking for power or it can be seen as a battle for the fate of the world against the machinations of an evil, galaxy spanning corporations trying to iron out the wrinkles in the brains of people thereby taking away their ability to think. 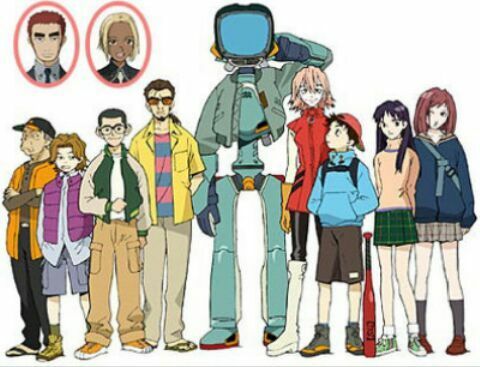 (See the giant iron above) I see FLCL as a bunch of stories about people at different stages in their lives trying to make sense of existence and their place in the universe. The characters are trying to figure out who they truly are at their core. The series is just throwing the most harrowing and strange and ludicrous situations at them to get this point across. 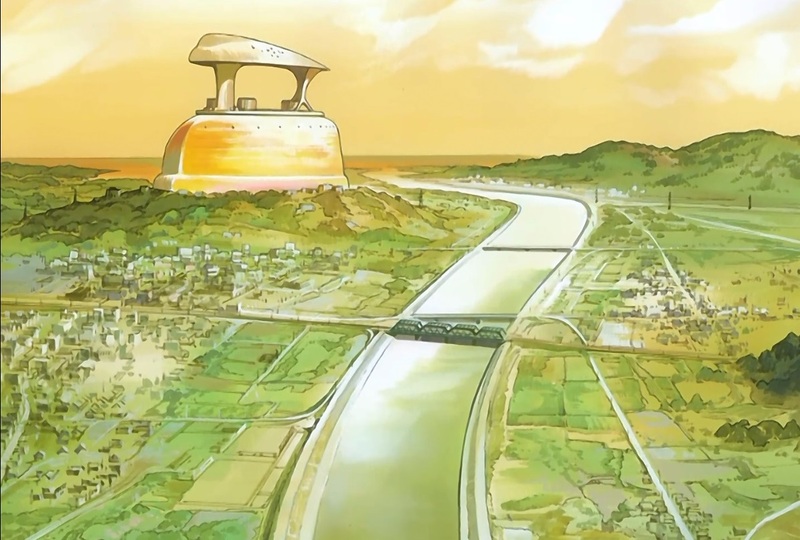 Plus a giant TV robot with a jacket that washes dishes. It's a fun show that you can either think deeply about or not think about at all. The animation is brilliant, the fight scenes are fun and the characters are all very unique, even the minor characters. I'm very excited to see what they do in the next two seasons going forward. 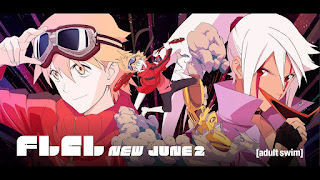 FLCL Progressive starts this weekend. FLCL Alternative comes in September.